Using John Saxon's Math Books - How homeschool parents can use them - and save money! For the first time ever - Digital Video Disks (DVD's) that provide real classroom instruction by an experienced Saxon math teacher. The instructor has taught using John Saxon's math books for more than a dozen years. NOTE: The DVD's can be used in either a television or computer DVD player. While the MASTERING ALGEBRA DVD series was designed to augment and enhance John Saxon's upper level math textbooks, they can also be used with other math textbooks as well. Students get to see and hear an experienced Saxon math teacher present actual classroom instruction. Advanced Mathematics (Lesson 63) NOTE: Course title is "Geometry with Advanced Algebra." The course is the first part in a two part series using the Saxon Advanced Mathematics, 2nd Edition textbook. This course follows successful completion of the Saxon algebra 2, 2nd or 3rd Ed textbook. 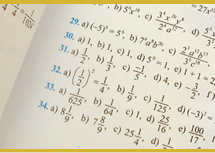 This course covers lessons 1 – 90 in the Advanced Mathematics book. Please Click Here to watch a short video which describes how the course is to be taught and credited. Advanced Mathematics (Lesson 24 – Calc Book) NOTE: Course title is “Trigonometry and Pre-Calculus.” This course is the second part of the two part series using the Saxon Advanced Mathematics, 2nd Edition textbook. This course follows successful completion of Part 1 described above. This course covers lessons 60 – 125 in the Advanced Mathematics book, followed by lessons 1 – 25 in the Calculus, 2nd Ed textbook. Please Click Here to watch a short video which describes how the course is to be taught and credited. To read more Comments on the new DVD Math Series Click Here.